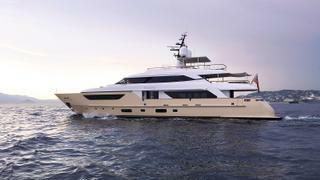 The 37 metre motor yacht Souraya, listed for sale by Vesa Kaukonen at KK Superyachts, has had a €1.4M price drop. Designed by Francesco Paszkowski, this yacht for sale was built in GRP by Italian yard Sanlorenzo to RINA class and delivered in 2012 as the fifth in the yard’s SD122 series. The graceful lines of this series pay homage to the great transatlantic liners of the 1930s. Accommodation is for 12 guests in five cabins consisting of a master suite on the main deck, a VIP suite, a double and two twins with Pullman berths, all with marble en suite bathroom facilities. In addition, she has quarters for seven crew. Her interior features eucalyptus wood for the floors and furnishings, with stainless steel inlays adorning the furniture. A comfortable lounge area in the main deck saloon has a large U-shaped settee to port facing an entertainment centre including a large flat screen television to starboard. There is also a bar while forward is a formal dining area with seating for 10 guests. The upper deck features a sky lounge with more facilities for relaxation including ample seating and a sophisticated audio/visual system while the aft upper deck offers a table and chairs for al fresco entertaining and dining under the stars. The sun deck comes with seating, a bar, barbecue, ice maker and a custom hard top for protection from the sun —perfect for outdoor dining. Twin 1,670hp Caterpillar diesel engines give her a cruising speed of 11 knots, topping out at 17 knots. Souraya is now asking €9.5 million.